Themes have been an important part of Gmail ever since we launched them back in 2008. Not only do they let you personalize your inbox with fun backgrounds, but they’re also practical, helping you easily differentiate between multiple Gmail inboxes (e.g. work and personal). You can upload your own images directly, select from your Google+ photos or simply paste any image URL. Or, if you don't have a particular image in mind, you can browse our searchable Featured Photos section to find one that speaks to you. With so many great options, it may be hard to choose, so to get a sense of the images available, try searching for ‘hdr scenery’ or ‘bokeh wallpaper' in the Featured tab. Whether you want to bask on a tropical island or simply reminisce about last year’s holiday with the family, your Gmail can now be customized to your mood. 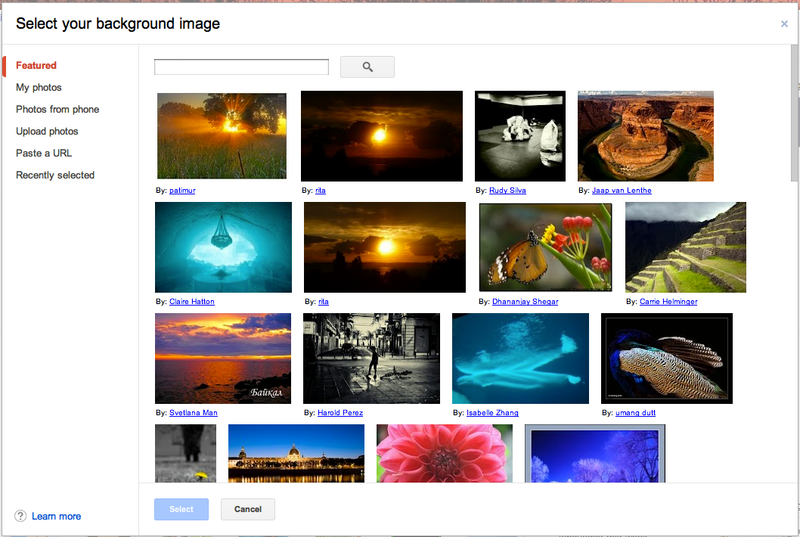 Find your perfect image and make your Gmail your own with custom themes.